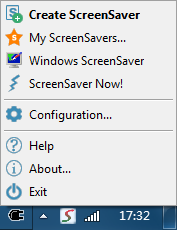 Uninstall is to remove !Easy ScreenSaver Station from you computer system. At first, make sure !Easy ScreenSaver Station is not running. You need to close both !Easy ScreenSaver Station main window and the running one in the background. Please click the tray icon located on the bottom right of the Windows desktop near the clock, then click "Exit" in the tray menu to exit !Easy ScreenSaver Station if it is running in the background. Use Add/Remove Programs from the Control Panel and select '!Easy ScreenSaver Station', then click the 'Add/Remove' button to uninstall.